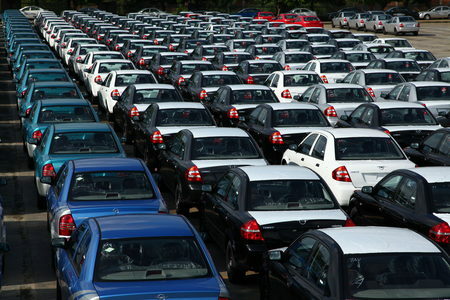 China auto sales are in for the first half and they are slightly ahead of the consensus of 5% growth for the year. Overall PV sales are up 7.1% over last year, and again we see a two-tiered level of performance. First-half growth was driven largely by a rebound on the Japanese brands after their hit from last year’s earthquake impact, and a push from luxury brands 2012 actions to move overbuilt inventory. Overall GM + the Japanese brands lead the increase while locals were relatively flat. 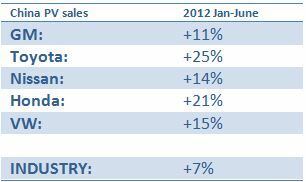 June sales were extremely strong +16%, I see this as mainly driven against the constricted J3 sales post earthquake in 2011. The Japanese brands drove market growth with newly stocked inventory. June sales were extremely strong for Honda in particular, up 84%. Nissan and Toyota had more regular supply last year leading to results more in line with YTD numbers.